Enjoy Cross Stitch is a biannual magazine packed with beautiful, modern designs for you to stitch and fashionable ideas to inspire you. Buy a single issue or subscription to Enjoy Cross Stitch magazine. Enjoy Cross Stitch is aimed at all levels of stitchers – whether you are experience or just want to take out a new hobby – it involves something for everyone with its creative projects and ideas it includes. 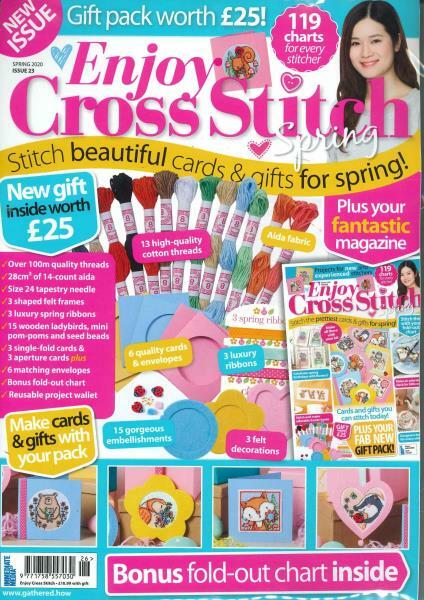 Each issue includes free gift packs which contain an impressive set of stitching goodies worth over £20. Enjoy Cross Stitch includes a shopping list in each step-by-step guide, unmissable sets of charts to start straightaway, a stitching glossary, steps and advice on how to use different stitching techniques. Complete both traditional designs to the newest needlework.